Founded in 2016, the Innovation Support Team is the sounding board for reviewing, evaluating, and recommending strategies, plans, and policies for innovative programs associated with the College of Education. The I.S.T. does not approve new programs but is advisory to the Dean and Assistant Dean for Finance and Administration. Identify strategic questions and areas of challenge related to executing new programs, including administrative, fiscal, human resource, marketing, participant support and learning and information technology. Identify opportunities where COE support services can help achieve rapid innovation in the College and streamline proposals. Support conferences, institutes, camps, professional exchanges, professional development, certificate courses, and degree programs. The Innovation Support Team is comprised of key areas leads within the College of Education. Step 1: I have a new idea or a substantive change* to a previously approved idea! *A substantive change would include things like new content area, new audience, new outcomes (degree, credit bearing, certificate). Step 1a: The first step is to discuss your idea with your Area and get the support of your Area Chair. Step 1b: Once you have the support of your Area proceed to step 1B please complete the initial proposal form below. Download a copy of the questions before completing the online form. Once your Step 1b proposal is submitted, all Area Chairs, Associate Deans and the Dean will receive the proposal and have an opportunity to consider mission fit and identify any redundancy with similar programs already offered through the College of Education. Any questions generated by the Area Chairs or Deans will be forwarded to the innovator and the Associate Dean of Professional Programs. 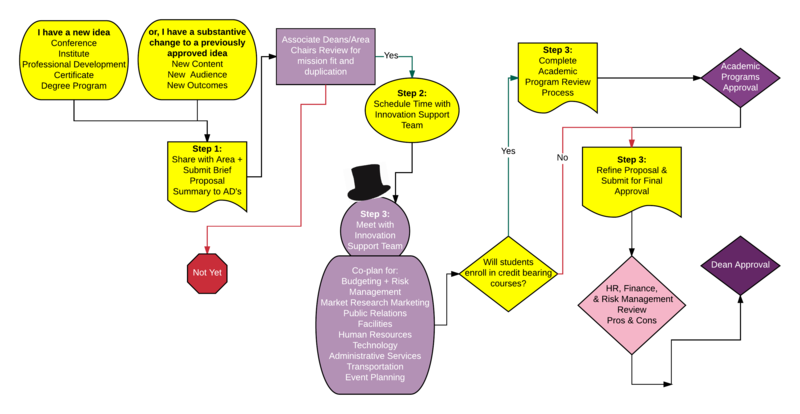 Once approved to move forward, you will then be scheduled to meet with our group at the next available Innovation Support Team meeting (meets monthly). During the meeting, IST members will help you think through the innovation, identify any additional areas to address and help you navigate college and university systems. Team members will help identify next steps in the process. After you have addressed next steps and incorporated any feedback from the Innovation Support Team, you will submit a revised proposal that will be reviewed by the COE Finance Team to ensure any fiscal, human resource and risk management aspects have been fully addressed. The COE CFO/COO review will be sent to the Dean for final approval. NOTE: If the innovation requires approval by the Academic Programs Committee you will need to secure both the Dean’s approval and the Academic Program Approval before enacting your innovation. Congratulations! You are now working on your idea with specific team members! Below is a checklist of common "To-do" items for new programs.